One of the different ways to make money online is taking part in giveaways, contest, sweepstakes. Many of these contests are available locally or worldwide participation. Recently, I have found many such giveaways through Facebook. Facebook has many pages of companies, blogs or other sites which sponsor these giveaways, sweepstakes, contest, freebies, coupons, etc. You can participate in these contests freely. I entered one of such giveaways hosted in a Facebook page by Taiwan Excellence. Name of the contest was I‘m Possible Lab. Different prizes were given to the winners. 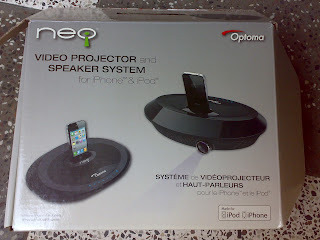 Luckily, I won a prize too; Optoma Neo-i Projector. This is my first big prize ever won with a value around $300. Thanks to Taiwan Excellence. Now I need to win an iPhone for using it in the projector. Just kidding. So if you want to earn money online, either cash or products, consider entering many contests available. Search google, facebook pages, blogs, social media sites, etc. I post many such contest links in my Twitter. You can checkout my Twitter, Pinterest or this blog for more info. Good Luck !